not on salaries. Every penny counts! 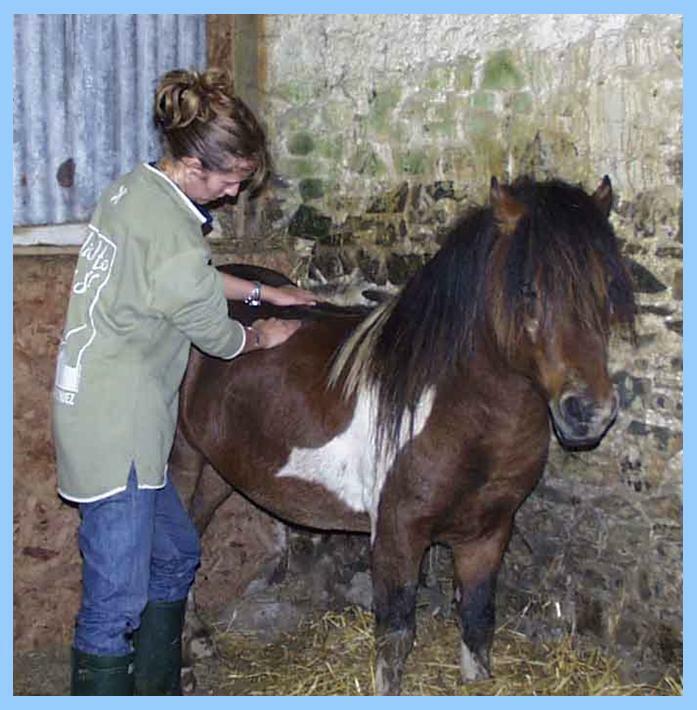 Our Pony Sponsorship Scheme is for the benefit of ponies who are so severely traumatised that they need long-term care and rehabilitation. They are unlikely to be offered a "normal" home in the foreseeable future, but are safe and content with us, living either at our main base, or out conservation grazing. * A sponsor booklet with details of your sponsor pony’s history. 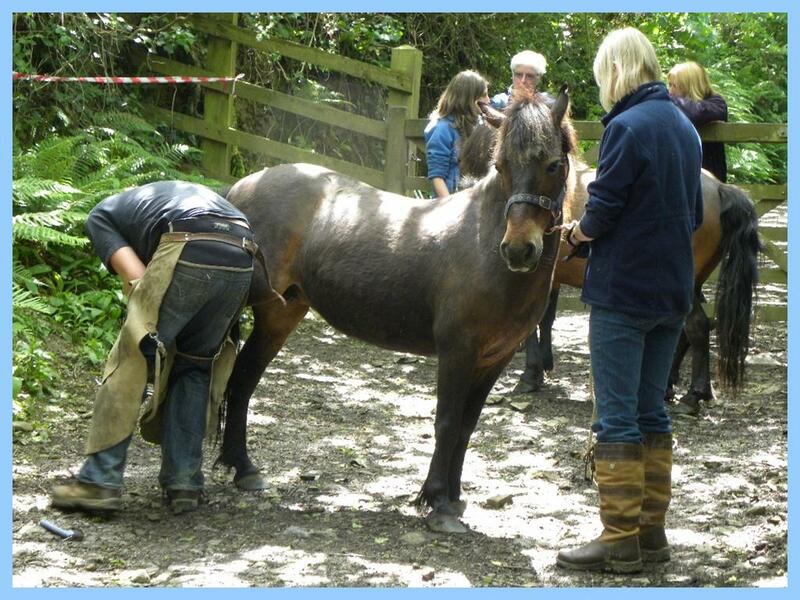 * A newsletter twice a year with updates about your sponsor pony and our campaigning work. Once you have chosen which pony you would like to sponsor, if you would like to pay by card please go to the Shop page on our website, if you would like to pay by one of the other options please get in touch with us at people4ponies@yahoo.co.uk or 07968 071179 so we can set everything up for you! Apache is a 11 hands high skewbald gelding. He was one of four stallions who came to us in November 2004. He has an ear notch - probably the major cause of his extreme fear. His high fear level means that he makes very slow progress with his rehabilitation, but using our special methods we can interact with him and see to his welfare needs. He grazes with Ebony on private land near Witheridge in Devon. Ebony is a 12 hands high black mare. When fiirst seen in the original herd, Ebony had a lovely skewbald foal with her. Ebony was very fierce in protection of her young and they had to be weaned before Paul and Cilla could progress with befriending her. She is a fine-looking pony but has been doubly ear notched which would account for her fear of humans. Gypsy Dan is a strongly-marked skewbald gelding, 11.2 hands high, born 1998. He was the secondary stallion of the group. He has been with us since June 2004. He showed extreme nervousness in the presence of humans but is now able to be led about and groomed, and is developing his trust in people. His fear is so deeply ingrained that everyday we have to prove to him that we are trustworthy. Bob Marley (Bobby) is a 12.1hh gelding and is a beautiful bright bay colour. He was a young colt in the original group of wild ponies. He is a nervous chap. He has no ear mutilations or brands, but it is likely that someone tried to do this to him but he managed to escape. The handling was still enough to scare him. Star is a 11.2 hands high dark bay mare. She was an older mare rescued with the original P4P herd. She has been notched on both ears and is very nervous. Her rehabilitation began in 2006. 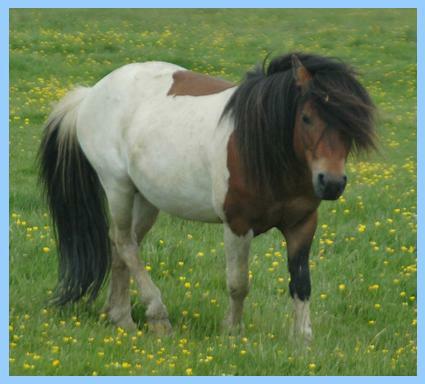 After her initial handling with us, she grazed on different nature reserves in Devon with other P4P ponies. In 2017 she came back to our main base and has teamed up with another elderly pony, Topsy. They are two "golden oldies" enjoying their retirement together. 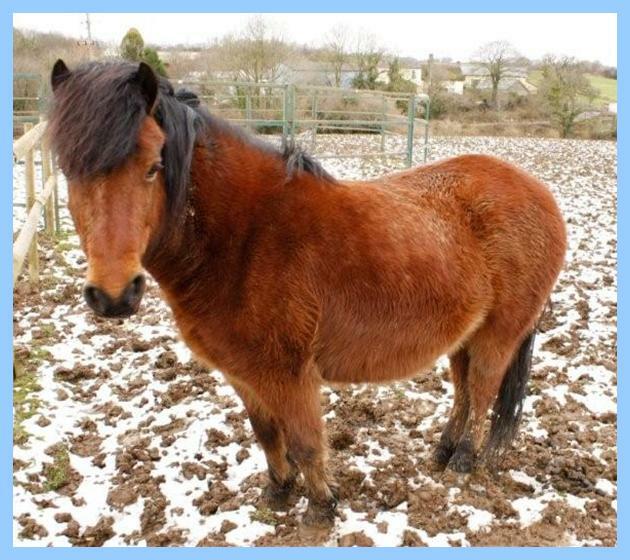 Frodo is our smallest pony at 10.2hh and is the mascot pony of p4p. He is a confident, cheeky pony and was one of the unhandled foals from the group. Frodo helps us at fundraising events. 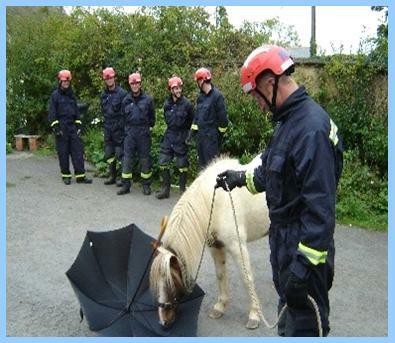 In this photo, Frodo is helping us to train firefighters from our local Animal Rescue Division who come to us for specialist training. Topsy came to us with her friend Tufty via a national animal charity who were unable to care for them any longer. 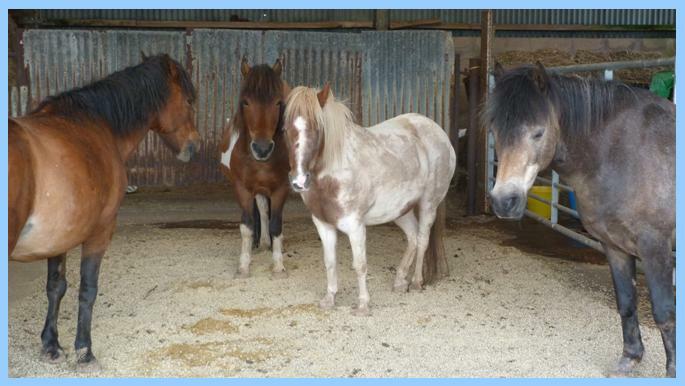 They are elderly mares who were originally seized from Bodmin Moor 13 years ago. 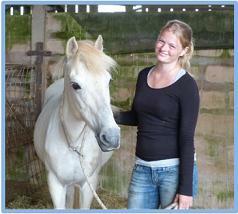 Both ponies had been ear-notched and branded, and were unhandleable until they came to us in September 2012. Topsy is extremely traumatised from the mutilations and the handling associated with these. Tufty had made very good progress but sadly we lost her to a lipoma in May 2013 - she was well into her mid 30s, and had transformed in health since she had arrived with us. Topsy has adapted well since losing her best friend Tufty, and lives with other members of the herd at our main base. Visitors often comment on how beautiful Topsy is! Can’t choose?? 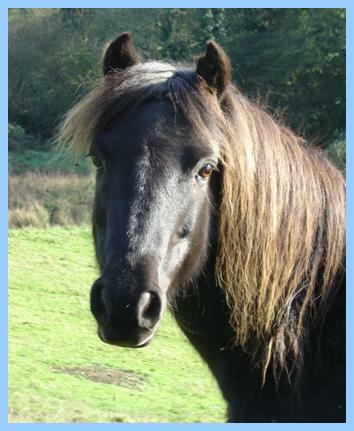 Why not choose to sponsor the herd for £2.50 a month...Your donation will go towards looking after all the ponies, and helping with our campaigning work which improves welfare conditions for wild ponies.